The latest evidence that Nintendo is evolving to fit the expectations of its audience, and the realities of its business, is news that the company’s latest sure-to-be megahit The Legend of Zelda: Breath of the Wild will be getting downloadable content, via a $20 Season Pass option. Despite being “one of the largest, most engaging video games Nintendo has ever created” it will release “two new sets of downloadable content for the game” later this year, and will be available for both the Nintendo Switch and Wii U releases of the game. These packs “cannot be purchased individually” according to Nintendo. Here are the details, straight from Nintendo: Starting when the game launches on March 3, players will be able to purchase an Expansion Pass for $19.99, granting access to two new sets of downloadable content for the game when they become available later this year. Immediately upon pre-purchase or purchase of the Expansion Pass, three new treasure chests will appear in the game’s Great Plateau area. One of these treasure chests will contain a shirt with a Nintendo Switch logo that Link can wear during his adventure, exclusive to the Expansion Pass. The other two will deliver useful items. The first content pack is scheduled to launch this summer, and will include the addition of a Cave of Trials challenge, a new hard mode and a new feature for the in-game map. The second content pack will launch in Holiday 2017, and adds new challenges that will let players enjoy a new dungeon and a new original story. 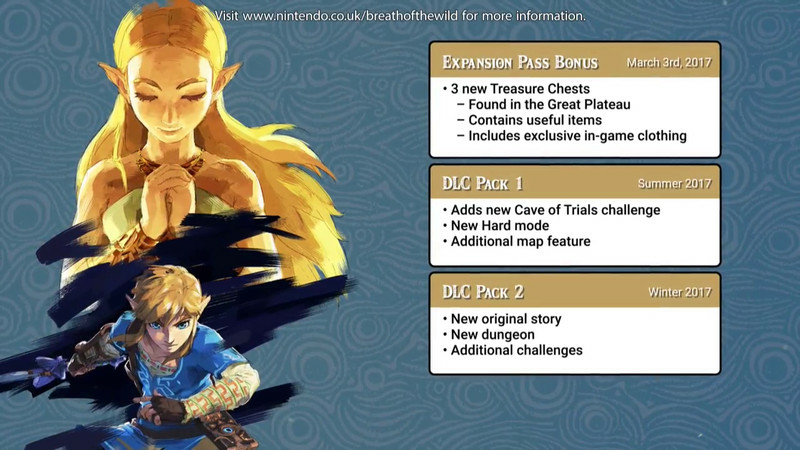 The Expansion Pass will be available for both the Nintendo Switch and Wii U versions of the game and are identical. Content packs cannot be purchased individually.